These 750 cc. cars provided more fun per cubic inch than any other class. Low budgets and high ingenuity provided a variety of interesting cars and close, exciting racing. You could search for days among cars of today and not find any like the H Modifeds that are as fun to drive. Ingvar Lindqvist's SAAB-powered front wheel drive car was always fast and a frequent winner. He won the class here at Del Mar in December, 1961. For all you H Mod guys... Here's a Crosley powered Special at Del Mar. Who's driving? Is the hood about to fly off? 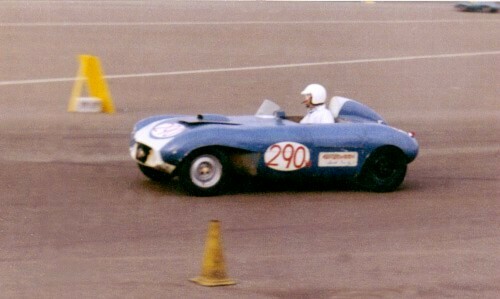 "In your first H-mod page the car #290 is a Miller-Crosley owned and usually driven by John Bukowski. This was the twelfth car built by Don Miller according to the list printed in the Small Times." Joe Puckett in his Crosley powered MPX Special. Puckett was a long-time "H" Modified enthusiast & wrote frequently on the subject in vintage racing magazines. 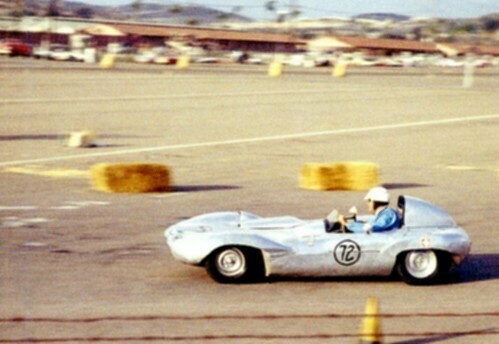 "Your picture of Joe Puckett's car is deja vu for me as I was his gofer off and on from 1959 thru 1961. It could be that Frank Davis was the driver in that particular shot since Joe always wore a black driving suit and a black helmet. MPX stood for "Manske-Puckett Experimental". Walt Manske was a former record holder in model airplane speed contests who decided to go racing. He built the entire car by himself including pounding out the nifty aluminum body on sand bags. Joe who had been racing a Triumph TR-3 bought the car and immediately proved to be as fast as Walt and then went on from there." had the engine laid over on its' side by some 30 to 45 degrees (don't know the exact amount). As far as I know this is the only Crosley-powered car to incorporate this feature." There's so much interest & enthusiasm for Class "H" Modified that it needs its own website. For now, aficionados discuss these fascinating cars on the "hmod" discussion group. More Class "H" Modified pages!